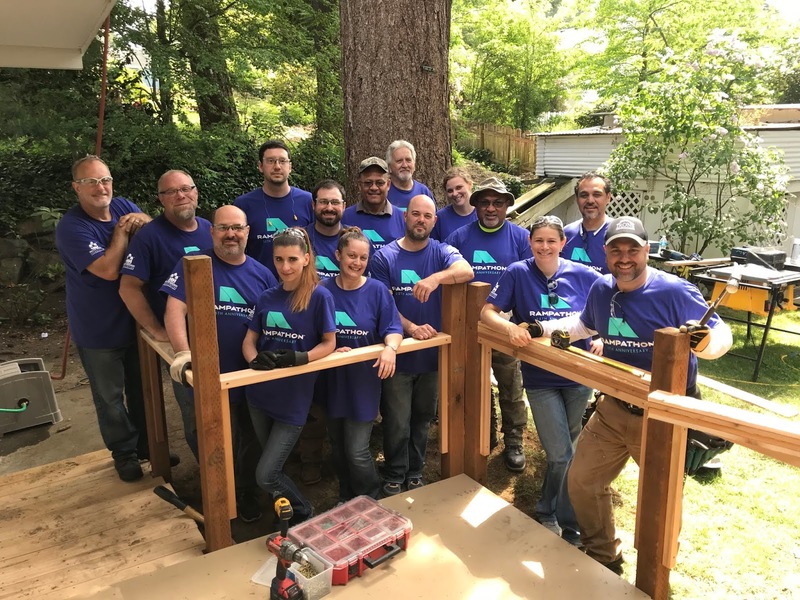 On May 19, the Master Builders Association of King and Snohomish Counties (MBAKS) celebrated 25 years of Rampathon, an inspiring community event where volunteers build free wheelchair access ramps to improve mobility for families throughout King and Snohomish counties. This year, MBAKS and its member volunteers constructed 50 ramps, which would be the most ever built during a single Rampathon event. Materials to build the ramps are donated by Dunn Lumber. Since 1993, more than 450 ramps have been built with over 30,000 of volunteer hours donated by local builders. 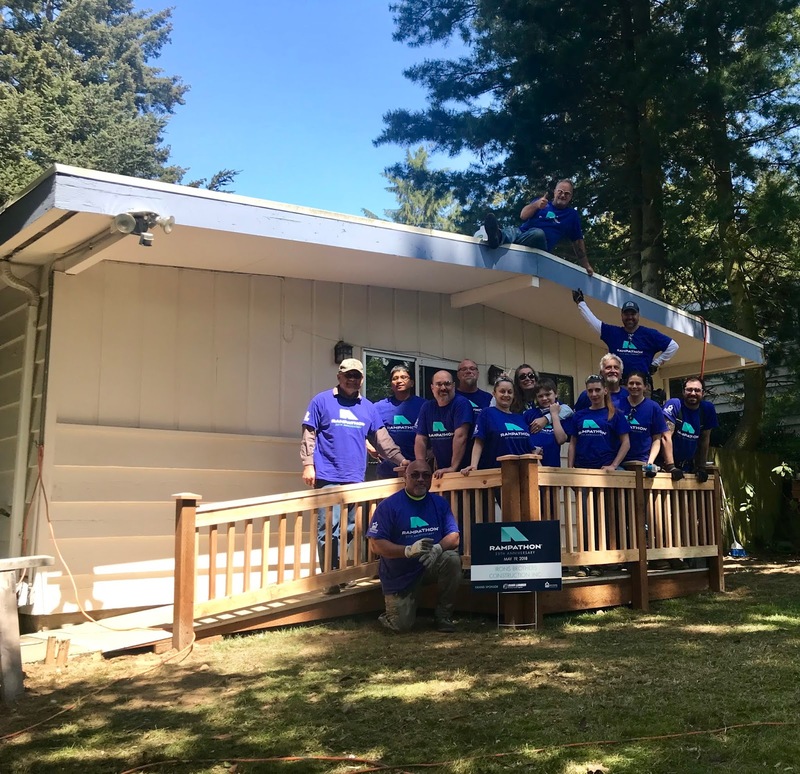 Ramp Captain Joseph Irons, President of Irons Brothers Construction and Past-President of the Master Builders Association of King and Snohomish Counties (MBA), along with his entire team of employees and skilled volunteers designed and constructed a free wheelchair access-ramp for a local Richmond Highlands resident on Saturday, May 19, 2018. Lynn, who suffers from a genetic condition which affects all the bones in her body and causes her joints to disintegrate over time, cannot currently go outside safely. When traveling away from her home she uses a scooter for mobility. Her home doorways are too narrow for the electric scooter to maneuver so she utilizes crutches to navigate from room to room. Lynn has adapted her master suite to accommodate her abilities but is unable to pass through the bedroom door into the backyard as there was currently no safe access. The Irons Brothers team designed her ramp to exceed simple backyard access. A 5’x 8’ landing off of her bedroom door includes a 27” high handrail that is lower than the typical code railing height but has been calculated for a safe height for her to use. The ramp allows the resident to access her back yard. Additionally, the landing area will be bordered on either side by a 8’ long ramp to the west and five 18” stair treads to the east side. The ramp team will also connect to her existing west concrete patio with a new concrete walkway. All of this not only creates safe access to her back yard, but it allows for her to enjoy her outdoor space, water her garden and watch her two playful Pomeranians. Lynn maintains a joyful and positive spirit and is very appreciative of the work that Irons Brothers Construction has agreed to do on her behalf. 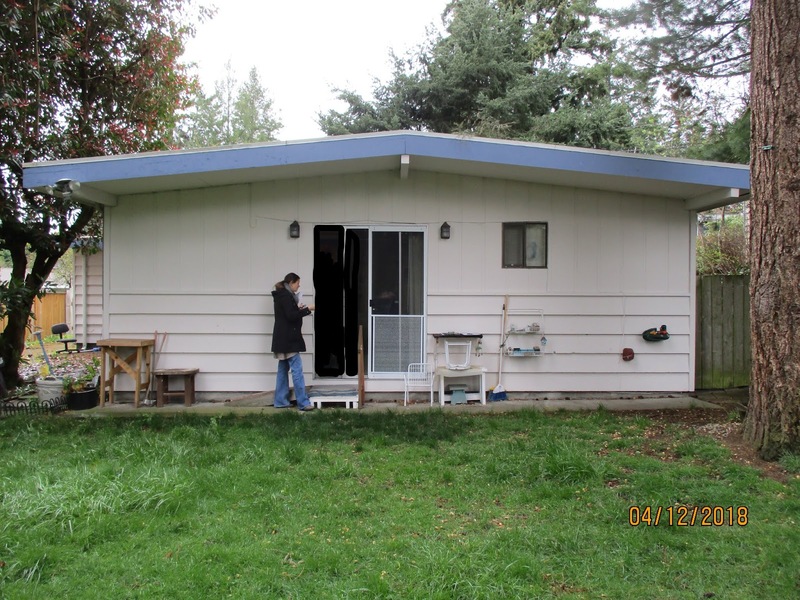 With this new access, Lynn is looking forward enjoying her home and an improved way of life. This free wheel-chair ramp is being built as part of the Master Builders Association’s 25th anniversary philanthropic project, Rampathon. This project was constructed out of easy to maintain and eye-pleasing materials and is just one small way that the local craftsman and volunteers from Irons Brothers' staff, trade partners, colleagues, friends, and family helped to change a local resident’s daily life. Irons Brothers Construction maintains the highest commitment to philanthropy and giving back to the local community. At the end of the day, the reward is that Lynn can safely use her crutches to be outdoors. Joseph and Melissa Irons, along with an army of staff and volunteers are passionate about helping others in their community. With over a decade of involvement in Rampathon®, as well as other events sponsored by the Master Builders Association, Irons Brothers Construction is a wonderful example of dedicated builders giving back to the neighborhoods they serve.